Every year, before the summer really starts, I spend hours in the grocery store, not knowing what to chose because most crates are empty: the cabbages have perished, green salads are finally flowering, all the beans have been picked and it's still some time before the tomatoes, cucumbers, aubergines and the zucchini can be harvested from the gardens. A vegetable easy to preserve and what I previously thought of as a winter vegetable, is filling the gaps of all those vegetables not yet ready for summer: beetroots! Cucumber and tomatoes are synonymous with Greek cooking, and not many people will believe me when I say beetroots also belong to the Greek kitchen. This vegetable even had its cradle in the countries around the Mediterranean Sea. According to old Assyrian writings beetroots were present in the Hanging Gardens of Babylon. In ancient times Egyptians and Greeks just ate the green stalks; it was the Romans who discovered the culinary side of the tuber. Greeks preserved the tubers for the gods and offered them in Delphi to Apollo, their weight counted in silver (turnips in gold). Aphrodite must have eaten tonnes of them because she believed it was beetroots that kept her beauty and lust for love alive. No wonder the Romans later thought beetroots to have aphrodisiac power. Even the walls of a brothel in Pompeij were covered with paintings of beetroots. There still is a belief that when two persons eat from the same beetroot, they will fall in love. And when in ancient times you ‘went to the beetroot fields’, it meant you were visiting the whores. Montgomery still used this expression during World War Two, sending his soldiers not only to the Killing Fields, but also to the beetroot fields. The beetroots on the plates of the Greeks and Romans in ancient times were not like the ones we eat now, rather more like a kind of wild spinach (the plant that was the precursor of the beetroot). That might explain why their leaves still taste like spinach. Moreover, the tubers were black or white. I am wondering how it is that through time the beetroots got their red color. Was it through the Crusaders having brought them from the battlefields drenched in blood? 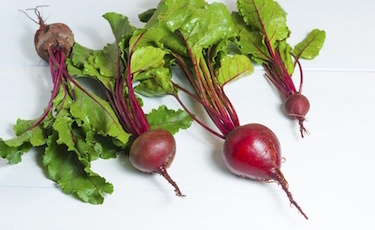 It was only in the Middle Ages that the red beetroots turned up in the European kitchens. There are masses of beetroot recipes. The oldest surviving cookbook, De re Coquinaria, by the Roman cook Apicius has two recipes for beetroots. The classical Greek recipe for beetroots is (just like all other Greek dishes) very simple: they are cooked and served with their green leaves, sprinkled with olive oil, lemon or vinegar. You may eat them together with a garlic dip (skordalia). I was very happy when last week I was served a new salad in my favorite Greek restaurant Meltemi in Skamnioudi: grated beetroots with nuts and a dressing that I cannot yet identify. My other favorite beetroot salad is served in Majoram (Molyvos) where besides traditional Greek they also serve fusion food and salads that are like mountains, only to be eaten by more than one set of knife and fork. This week when I cooked beetroots, I was wondering how to dress them: I still had those grated beetroots in mind, so I decided to give them a go. But where to get nuts? It was too late to crack walnuts or to crush almonds and peel them. Then I saw a pot of serundeng, a leftover from an Indonesian meal. Nuts! And coconut? Why not. I mixed two tablespoons with mayonnaise, one tea spoon honey and three tablespoons of serundeng and put it over the rasped beetroots: divine! In ancient times and in the Middle Ages there was a strong belief in the medicinal benefits of beetroots. Modern food gurus now confirm how healthy it is to eat them. Before the tomato-madness breaks out, I will be cooking plenty of these undervalued, purple-red tubers. Greece is not only the country of tsatsiki and choriatiki, but also of these by Aphrodite so much appreciated pantsaria (beetroots).